The Town of St. Joseph is rich in outdoor recreational opportunities. This Town of St. Joseph park is a 24 acre natural area south of the Town Hall and St. Joseph's Emergency Services facility. This St. Croix County 80 acre park is situated around the northern half of Perch Lake and is the central feature of the park. The lake reaches 90 feet deep in some areas. The land area includes steep slopes covered by oak woodlands and pine plantations. 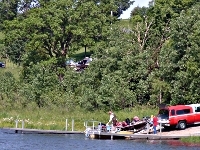 Town of St. Joseph 0.5 acre site provides Perch Lake visitors with parking and non-motorized boat launch. This Wisconsin State Park includes a dam, lake, trout stream, sandy beach, prairie remnants and a nature center. All features of the Willow River State Park's 2,891 acres of rolling countryside. Enjoy spectacular views of the historic Willow Falls and the Willow River Gorge. Parking: Paved lot for 17 vehicles and/or boat trailers. This playground is owned by Hudson School District # 834 School. The approximately 10 acre area includes play equipment, a field with a backstop, basketball hoop, restored prairie and gardens. Located on the western boundary of the Town of St. Joseph, on the St. Croix National Scenic Riverway. The City of Stillwater in Minnesota has owned Kolliner Park since 1917, when the East Side Lumber Company donated the property to the city. The 4.7-mile interstate loop trail is now under construction, with all segments of the Loop Trail expected open in 2019. June 2018 the newly completed parking lot in Wisconsin is accessible from County Road E.
Historic Cemetery, 1-acre in size, is located in the Settler's Glen neighborhood. John and Hermina Thelen settled the land in 1863 that eventually held this cemetery. They had seven children. Their son Edwin died at three years of age in 1886. They had left the Catholic church and so decided to set aside a one acre plot in the woods on the highest point on their land. The home, cemetery and land stayed with the family until 1965. In 2001, 150 acres, including the cemetery, were sold to a developer. Prior to the sale the owner cut 65 large trees on the grounds leaving it in a sad state. The Town of St Joseph obtained the ownership and care of the cemetery. The grounds were cleaned of the timber slashing and a design proposed many years ago by a son, Andrew Thelen, was put in place. Five monuments are on site.